Club Member Ticket Price: $65.00 per person (Discounted price valid for up to 2 tickets...that's a savings of $15 off per person or $30 off per couple! If you're purchasing 3-8 tickets, your $30 total discount will spread across all tickets) *** CLUB MEMBERS: LOGIN TO RECEIVE $15 OFF YOUR FIRST TWO TICKETS! HAVING TROUBLE? CALL US at (518) 668-9463 M-F 9am-5pm. GOLD CLUB Extra Perks: In addition to the above discount, enjoy VIP Seating and (1) Complimentary Glass of Wine during the Welcome Reception! SEATING REQUESTS: at checkout in the "notes" section, please provide the names of everyone in your party and let us know if you have any requests to sit with another group and we'll do our best to accommodate. 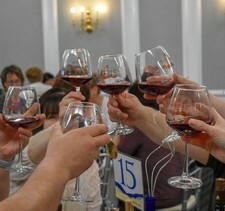 6-6:30pm: Welcome Reception at the Fort William Henry Tankard Tavern, featuring exclusive tastings of our newest wine, fun games, wine, cheese, featured wine cocktails at the cash bar, food samples from a guest vendor & more! After Party 9pm+: Hang around at the Tankard Tavern and visit with old and new friends, dance the night away to music by DJ Duane Bullard of Mobile Sound Unlimited, and enjoy a few more of our specialty wine cocktails at the bar! Friday, April 12th - Sunday, April 14th 11am to 6pm: Cheers to the Years at the Tasting Room - Enjoy a special 11th Anniversary Ultimate Wine Tasting Package featuring locally made fine foods with special wine pairings just for this occasion! Plus, we'll have Games, Prizes, Wine Cocktails, Vendor visits with food samples & crafting activities and more! Make a weekend out of it with a special room rate just for Adirondack Winery 11th Anniversary attendees! The Fort William Henry Hotel offers upscale lodging accommodations with the perfect mix of historical elegance and today’s conveniences. From the traditional grace of the Grand Hotel to the comfort of the Premium East and Standard West rooms, all of their accommodations enjoy access to extensive amenities, including an indoor pool with sauna and Jacuzzi, an Olympic-size outdoor pool, and three restaurants, all on resort grounds. 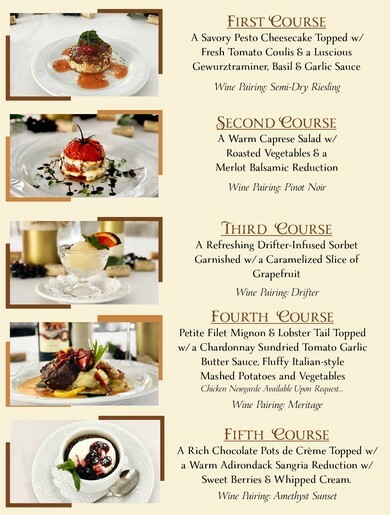 WINE DINNER DRESS CODE: "Casual Dressy"
This dress code calls for a just slightly dressier version of your most casual look. For women, dress up your go-to pair of pants with a fun pair of ankle boots, add heels to elevate flared jeans, or pair a jumpsuit with a collared shirt. For guys, dress up your favorite pair of clean-cut jeans with a blazer and you'll be good to go; or wear a nice pair of khakis with a classic button-down shirt - tie optional. Fool-proof Outfit: Black pants, a blouse, and ankle boots for women, and jeans and a sports coat for men. Check back soon for more news on this incredible weekend!